Another winter warmer on the menu today! 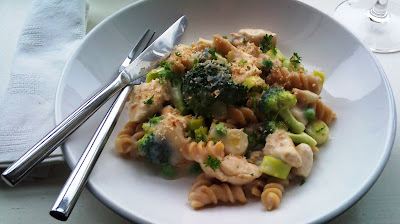 This dish combines chicken, broccoli, leeks and pasta in a creamy white sauce. Most pasta bake recipes use cans of soup to make the sauce, which adds more calories and expense to the meal. Not here! This dish has a simple white cheese sauce that tastes great and would work well served over pasta on it's own. The following recipe makes makes two portions. • 70g peas. Fresh or frozen. Heat a medium pan over a high heat. Add the boiling water and bring back to the boil. Crumble the stock cube into the water and stir to make sure it's combined. Then add the pasta, stir and return the pan to the boil. When it's back to boiling for a minute or so, reduce the heat to medium and let it simmer away for 10 minutes. Next, heat a separate pan to a high heat. When hot, add the four sprays of spray oil and stir fry the chicken for approximately 5 minutes until it's lightly browned. When it's done, add to a large ovenproof dish. Reduce the heat to medium and return the pan to the heat. We'll use this pan to cook the onions and leeks once the broccoli and peas are on. Once the pasta has been on for 5 minutes or so. You need to get the broccoli and peas on. You can either steam them in a steamer or colander over the pasta (covered loosely with a lid) or you can just add them to the water with the pasta for the remaining 5 minutes. Meanwhile, in the pan you used to cook the chicken, add the butter spread. 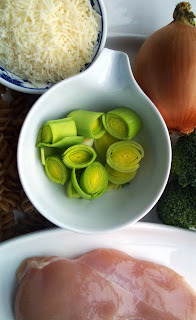 When it's bubbling, add the onion and leeks stir fry for 10-12 minutes. Lightly season the vegetables with salt and pepper. Next heat the oven to 200°C. Remove the pasta, broccoli and peas and drain in a colander. Add to the oven proof dish while you get on with the sauce. To make the cream sauce, heat the pan, in which you cooked the onion and leeks, over a medium to high heat and add the milk. When the milk is warm, add the flour and stir well with a whisk to combine. Bring to the boil stirring constantly to remove any lumps. 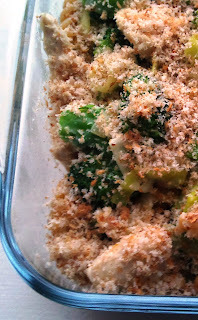 When the sauce has thickened, remove from the heat and crumble in the vegetable stock and half the parmesan. Taste the sauce and add salt and pepper if needed. If the sauce is a little thick, add a little more milk or a splash of boiling water. If too thin add a little more flour and bring back to the boil, stirring constantly. When the sauce is ready. Add to the chicken and veg and stir well to combine. Sprinkle the grated breadcrumbs over the dish and bake on the oven for 30 minutes until the breadcrumbs are golden brown. Remove carefully from the oven and sprinkle the remaining parmesan on top. Garnish with parsley and serve in warmed bowls/plates.